So you fancy inviting a few friends round for the evening and you'd like to prepare some food. The problem is you just can't face the stress of preparing a big, intricate meal. Maybe you've invited too many people to fit around the dining table; maybe you don't have a dining table. Well, there's no need to worry, help is at hand! A dinner party doesn't have to be a sit-down formal affair. As the host(ess), it's your prerogative to decide exactly what food and drink you're going to serve and how you're going to serve it. Your guests will be happy to have an invite and will appreciate any effort you've gone to with regards to food. There are plenty of options if you want a no-fuss evening during which you can spend the maximum amount of time with your guests and the minimum time in the kitchen. You could prepare a few different small snacks or just one quick dish. This quick and easy snack can be prepared in advance then just popped under a hot grill for a couple of minutes when you're ready to eat. Slice a ciabatta or French stick into thin slices, arrange on a baking tray and drizzle with a little olive oil. Top with chopped tomatoes, olives and basil; green or red pesto; or goats' cheese. This is a really quick snack that's perfect for soaking up a few drinks. Spread a couple of bags of tortilla chips into an ovenproof dish and sprinkle over a decent amount of grated cheese. 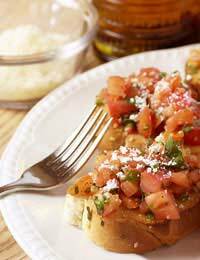 Place under the grill until the cheese melts then top with tomato salsa. Top with grated chillies and serve with guacamole. Boil some baby new potatoes for a couple of minutes. Meanwhile, heat a little oil in a large ovenproof dish, in a hot oven. Drain the potatoes well, toss in the hot oil and cook in the oven for about 20-30 minutes, until browned. Transfer to a serving dish, spoon over some pesto and provide cocktail sticks to eat them. Buy a mix of white and wholemeal mini pitta breads. Drain a couple of cans of tuna and mix with a good dollop of mayonnaise. Grate a large wedge of cheddar cheese. Make a slit in each pitta and spread with a spoon of the tuna mixture then sprinkle in some cheese. Preheat the grill, place the pittas on a grill tray and grill for a couple of minutes, until the cheese begins to melt. Split a pack of muffins in half, spread each half with a teaspoon of pesto then top with a couple of sun-dried tomatoes and a slice or two of goats' cheese. Grill until the cheese starts to bubble and melt - quick and delicious! These are just a few ideas to get you started but there are loads of other things you can try. Different breads and dips always go down well, as do stuffed olives, homemade pizza, and baked potatoes. Most of these dishes are either really quick to prepare, or they can be mostly made in advance.